The text of the King James Version (KJV) of the Holy Bible (also called the Authorized Version (AV) by some) is in the public domain. For the history of this Bible version you may consult this Wikipedia entry: Link. You may copy and publish this Bible version freely. 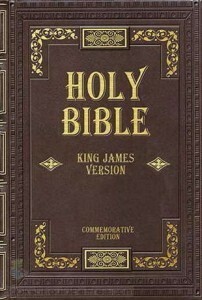 This Portable Document Format (PDF) version of the King James Holy Bible is also placed into the public domain. It was created directly from the public domain text and converted to PDF format using “DaVince Tools”, a software product that converts text files and other file formats into PDF. You may also find other useful companions to bible-reading here on the site: The Bible Atlas and Smith’s and Eastons Bible Dictionaries. he is lord and the only way of the world today. i like too! say thank you! I’m only downloading this so that I can see how — it is, and to rub in the face of Christians that they’re wrong. Go ahead and do your thing man, whatever feels right for you. Thanks! I love reading fiction! this is the chance to get an access. God bless of all u and ur .. . . . .. I like this library it is helpful to me. I thank God for granting you His Grace to do His ministry such as this. I would greatly appreciate your efforts to bring out more of His Holy Word in other various languages. Let me request you selfishly to make available the Holy Bible in ODIA/ORIYA language. thank you! your work is really very appreciative.May GOD bless you. only one real god, but he who???? just study GYAN GANGA book for known ans this question. Thanks for providing a good material. Thank u so much. I’m in real situation now n hope this could held me. Answer me God. Thank you very much for giving me the opportunity to faster retrieve Bible texts by means of this digital format. May God bless you and may many souls find the road to God by means of the Holy Bible. That can be found as a module to the E-sword/Eloquent/AndBible software, Smith&Van Dyk if I remember. thanks a lot, i’m not a devout, i’m a rather agnostic person. But i needed this in order to old english and christian literature, may your faith be with you. God bless you! I’m a Russian Orthdox Christian and the English version of the Holy Bible would help to improve my skills in English. God be with you! there are many errors in the bible (scientific as well as logical errors) but not a single error in holy Quran why don’t you think the bible followers. The problem with Deedat is that his understanding of the Koran differs from that inside Saudi Arabia. So which is correct, the Koran in Durban, or the Koran in KSA? Holy Bible – Spanish – Spanish Reina Valera Translation. kindly provide me with printable holy bible through my email. Please translation in Assamese language the bible. I’m looking for a pdf version or book version (that can be shipped to Canada)of the bible that has the Hindi translation beside the English script. Can anyone help? God be thanked for this website. To day I downloaded a holly bible so I can be with it every where! God bless every one of you for the perticipation and may God bless you all!!! I need an ENGLISH/YORUBA version…do you have this? Where, on htis site, am I able to locate a KJV Tagalog Bible? I am looking for the earliest edition written of the Holy Scriptures. Please help and thank-you very much. I thank God for you and your team. Making the Word free will add value to so many lives. My Sunday School teaching is now very easy. I will no longer depend on the Audio version or the voice others reading for me as I am visually impaired. May God richly Bless you and the fruit of your labour. I am old and lonely. I get depressed. Being able to read the bible provides comfort and hope. I am so grateful to the facilities provided by this website. A big thank you to all who make it possible to help people like me. Dear Martin, you are so welcome here. wow am very grateful for website i was looking forward to have a bible of my own, on my laptop, thanks very much that you have helped me to have it, may JEHOVAH Bless you in Jesus Christ name. Thank you for sharing the great love of Christ Jesus our saviour.Praise the Lord. Thank you for sharing. I am reading a print version of the Bible and wanted a digital version so I can search by keywords to help my understanding.